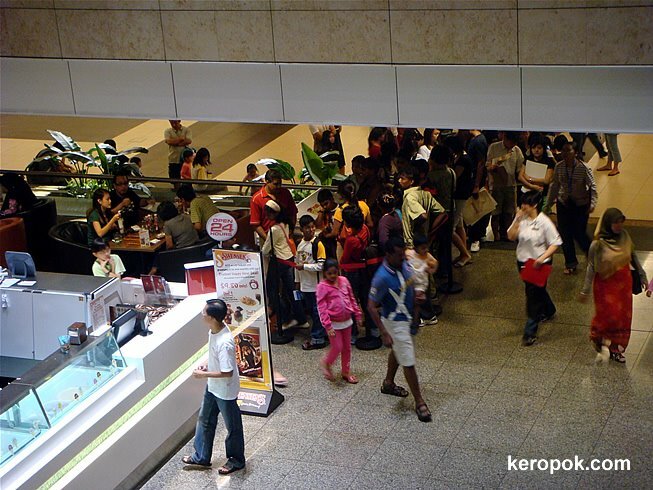 'Boring' Singapore City Photo: Long queue at the Swensen's at the airport. Was at the airport to help a friend book last minute flight tickets. The ticket is for a flight in less than 12 hours, so internet booking is closed. Telephone reservations seems to be forever on hold. (yes it's the company that has the first A330 company) So had to made a trip all the way to the airport, as that's where airline ticket offices are still open. Happen to see this when I was there. It was nearly 10 PM and there seems to be a hungry crowd! There's so many people queuing to go into Swensen's. I wonder why.... No, I did not bother to find out, going home to sleep was what was on my mind. Do you feel hungry when you get down the plane? I always do! LOL. Talking about airports, it seemed that the there has been lots of luggage problems at Heathrow's T5. Maybe if they had a more comprehensive test like what they did in Singapore, they would have not incurred the wrath of so many passengers. Yes, Heathrow's inability to get sorted is unbelievable! How does the world think we'll cope with the Olympics?! Full marks to Singapore; on our visit last year checking in and out was almost painless and we had bicycles as part of our luggage.